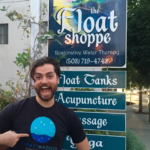 This week, the gang is joined by Greg Griffin from Float Madison! Greg shares how, after initially becoming a float fanatic, he started encouraging others to open a float center in Madison so that he wouldn’t have to make the long drive to Chicago to float. Then, while traveling the country and floating at different centers, he learned from other center owners that he absolutely could do it too. 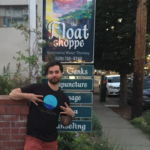 He then hit the ground running to become immersed in the float community, begin fundraising, including crowdfunding, and develop a business plan. Greg has some advice for anyone thinking about crowdfunding their project. Anyone who has been following Greg on Float Facilitators knows that he has run into an exorbitant amount of obstacles and delays in the process of opening. From the city shutting off plumbing a week before opening and a quartz tube of his tank arriving shattered to soot from a clogged chimney covering the walls, he shares the outlook he held to navigate through the bumps and maintain resilience. But first, Dylan and Amy tackle the topic of committing to getting things done. As projects pile up and become seemingly more massive with each passing day, how does one initiate a mental override to “just get it done”? Dylan reflects on The War of Art by Steven Pressfield and the ideas within the book that he’s found helpful. For Amy, two days in an AirBnB is an opportunity to step away from distractions and focus on her to-do list. Our hosts also discuss soundproofing windows in float rooms, guiding employees to step into the mindset of an owner, and customer reactions following Float Nashville’s recent price increase.